Every big game deserves a good tailgate. But we’re not talkin’ you and your friends hanging out in the parking lot with a couple of beers and hot dogs. We’re talking about a truly incredible, picture-or-it-didn’t-happen pregame experience. One of the biggest names in style and entertainment is throwing a party on Super Bowl Sunday in Atlanta this year and you’re invited! Come join us for the Maxim Pregame Experience, where you can expect plenty of food, drinks, and the absolute best in entertainment. You won’t find any event this exciting in downtown Atlanta on Sunday, February 3rd… well, except the Super Bowl itself. Did we mention that DJ Snoopadelic is performing?! Each year, the Maxim Big Game Experience is one of the most famous Super Bowl parties of the big weekend. It’s known for its lavishness, beautiful models, epic concerts, and exclusive venue. In the past, Maxim Big Game Experiences have attracted celebs and star athletes like Lil’ Wayne, Iggy Azalea, Ludacris, Cardi B, Justin Bieber, Kate Upton, Terrell Owens, and Odell Beckham, Jr. We have no reason to think this year will be any different! But this time, Maxim Experiences is throwing another party on game day to get you hyped for kickoff. They haven’t participated in any Super Bowl pregame action in seven years, so you can expect this will be one for the ages! Find no fee Super Bowl Party & Pregame Tickets! As you may know, TickPick threw a tailgate of our own for fans in 2018. But this year, we’ve decided to partner with the king of Super Bowl parties to create a pregame that you won’t want to miss. If you’re in Atlanta on game day, this is the ultimate place to tailgate. 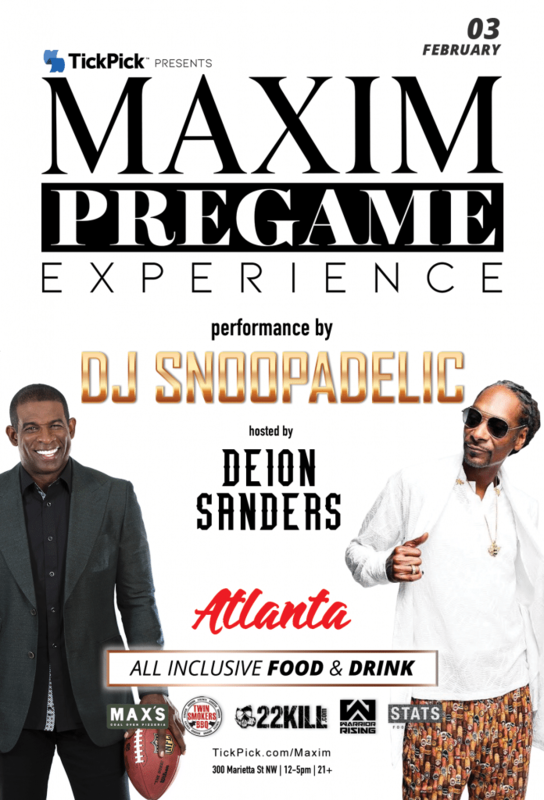 DJ SNOOPADELIC, Deion Sanders, and a Good Cause! 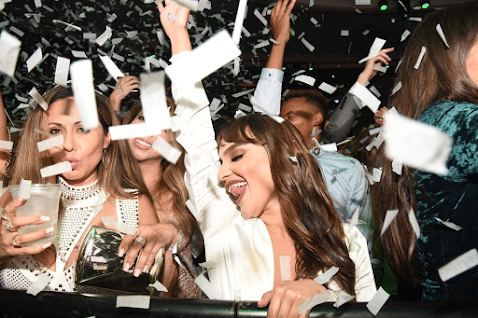 On Super Bowl Sunday, get up, get dressed, and head downtown to party with DJ Snoopadelic, aka Snoop Dogg, who’ll be headlining the Maxim Pregame Experience. Not only that, we’ll have DJs performing all over the entire venue throughout the day, even up on the rooftop deck! NFL Hall of Famer and TV sports analyst Deion Sanders will be hosting the party, and you might even catch a celebrity sighting or two! Where else are you going to attend a game-day concert quite like this? When you’re not dancing and people watching, TickPick will also be hosting a silent auction at the event where you’ll have a chance to bid on rare sports memorabilia. The proceeds will go to benefit nonprofits like Warrior Rising, an organization that provides veteran entrepreneurs with mentoring services, partnerships, and funding to support their business ventures, as well as 22KILL, a group that combats suicide and raises awareness by empowering veterans and their families through traditional and nontraditional therapies. TickPick will also honor a few Medal of Honor recipients at the party! Signs popping up all over #DowntownAtlanta that the #Superbowl is near! Seen a billboard, sign or venue going up? We want to see it! Tag us and #ATLSB53 to be featured. Any guesses where this #Atlanta #artwork is located? STATS Complex, an incredibly unique venue that interconnects STATS Brewpub, Max’s Coal Oven Pizzeria and Twin Smokers BBQ – providing party-goers with a full-on bar and restaurant hopping experience that spans 30,000 square feet filled with flat-screen TVs, tables, dance floors and even a rooftop deck. If you’ve got Super Bowl tickets, lucky you, the venue is located just four blocks from Mercedes-Benz Stadium, about half a mile away. (Yeah, you can walk!) Just FYI though, you don’t need Super Bowl tickets to come to our pregame! This conglomeration of great restaurants means you’ll have gourmet food and top-shelf drinks all afternoon, from noon until 5PM, not to mention plenty of space to party. STATS is also equipped with plenty of LCD flatscreen TVs, projector screens, multiple bars, and that scenic rooftop deck we mentioned. This massive venue once hosted the 1996 Atlanta Olympics Adidas VIPs so sports nerds can check out some of the original artwork for a look back at history. Dirty bird, fries and a beer. What a combo for this college football day. Join us today for your chance to win your very own @otterbox cooler! This is a party by Maxim Experiences, so needless to say, the cuisine will not be your average tailgate food. Our pregame affair will have multiple premium, buffet-style options where you can graze as you prep for the Super Bowl. We’re providing a gourmet spread of diverse dishes to fill you up before kickoff. We’ll have the usual bar food suspects, like wings, sliders, and dips, but we’ll also have coal oven pizza, pasta, prime rib, and tiramisu. And it’s Atlanta, so we haven’t forgotten about Southern favorites like barbecue, brisket, mac n cheese, and even collard greens. Be sure to come hungry! We hear you. Whether you’re actually going to the Super Bowl or not, you’ll need some drinks to prepare for the excitement. We’ll have an open bar where you can order cocktails, beer, wine, and of course, non-alcoholic options too (After all, you’ll want to stay hydrated. Day drinking is a marathon, not a sprint!). Guests will have access to a premium open bar at the Maxim Pregame Experience. We didn’t scrimp on the booze either. Our bars will offer top-shelf liquors, like Ketel One Vodka, Bombay Sapphire Gin, Johnny Walker Black Label Scotch, Maker’s Mark Bourbon, and Bacardi Superior Rum, Herradura Tequila. We’ll also be serving Canyon Road Wines, including Chardonnay, Pinot Grigio, Cabernet Sauvignon, and Pinot Noir. Of course, it wouldn’t be a tailgate without beer, so we’ve got plenty of premium and domestic options. You’ll also find mixers, soft drinks, ice, and water at the bars. Get Tickets to The Maxim Pregame Experience! If you want to check out the Maxim Pregame Experience for yourself, be sure to get your tickets before they sell out! You won’t find a better party in ATL on game day. General Admission Tickets start at $399 and they include food, drinks, and entertainment (you know, DJ Snoopadelic, remember?). Buy tickets here! Got a big group? We’re offering private booths in the fight room with flat-screen TVs for groups of 10. For something super unique, STATS also has three Tap Tables where you can pour your own beers, no bartender required! We’ll be selling those to groups of 10 as well. If you’ve got a larger group and you’re looking to make your pregame experience truly epic, reserve your private booth or table by emailing [email protected]. Want to be a sponsor? Email [email protected] to inquire about our sponsorship packages. Lagardère Sports and Entertainment and Rooftop2 Productions are producing the Maxim Pregame Experience. TickPick is the exclusive ticket and hospitality partner of this pregame event. Join Maxim Experiences and TickPick for one of the best Super Bowl pregame experiences in Atlanta on Sunday, February 3rd! If you have any questions or need help purchasing, contact the TickPick support team any day of the week at [email protected] or call 845-538-4567.